You are currently browsing the category archive for the ‘project’ category. 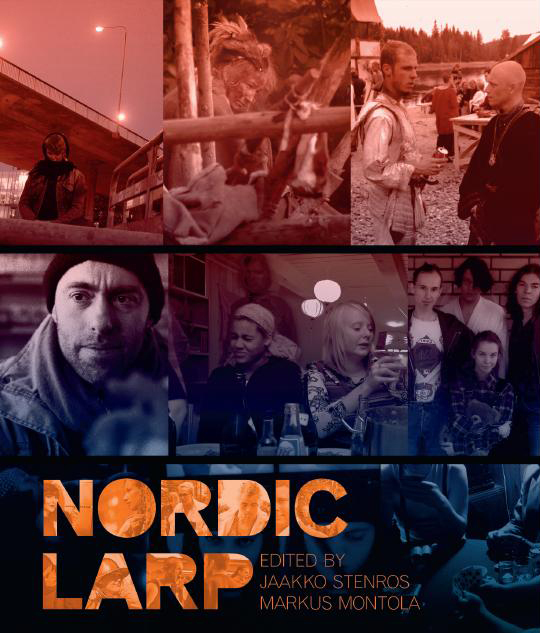 The award-winning, sold-out Nordic Larp is now available as a free digital edition. Up until now, the book, edited by game researchers and life-long role-players Jaakko Stenros and Markus Montola, has been a difficult to find treasure for role-play enthusiasts, researchers, and artists. Live action role-playing has developed into a unique and powerful form of expression in the Nordic countries. Nordic style larps range from entertaining flights of fancy to the exploration of the intimate, the collective, and the political. This unique tradition combines influences from theatre and performance art with gamer cultures, in order to push the boundaries of role-playing. Recently the Nordic larp tradition has gained attention internationally. This book presents a cross-section of this vibrant culture through 30 outstanding larps, through stories told by designers, players and researchers, with over 250 photographs. In addition the book contains essays explaining the history and rhetorics of Nordic larp, and contextualizing it in relation to theatre, art and games. The book has been hailed as “mandatory reading” (Aaron Vanek), “a remarkable tome” (Mike Tice), and a “major cultural service to game, culture and art studies” (Frans Mäyrä). According to Lizzie Stark “Anyone interested in the future of larp and its possibilities as a medium should read this book.” In 2012 Nordic Larp received the Diana Jones Award for Excellence in Gaming. Edit: Don’t be intimidated by the Finnish on the site. The site translates into English from the upper right hand corner. Nordic Larp Won the Diana Jones Award! Nordic Larp is a history of the Nordic larp scene, from its inception in post-D&D fantasy through experimental drama, historical recreation and far freaking weirdness, done as a massive and profusely illustrated coffee-table book, written by two gaming scholars. The book documents more than thirty larps that took place over 15 years, including ones with animatronic dragons and a space opera played out on a submarine. The Nordic Larp book assembles photos, memories, and designer notes, allowing the reader to survey these fantastic and sometimes legendary events. These records are bracketed by an introduction that summarizes the recurrent elements of the larps and a final essay on Nordic larping as art, theater, and game. Nordic larping is a major, dynamic branch of the gaming family tree, fully deserving of this massive, beautiful book that takes larping and game-history as serious business. We were super-excited about being nominated, but did not at all expect to win; for a non-American thing just to get nominated is a big deal. We also did not have the funds to attend the award ceremony at Gen Con. We did, however, write an acceptance speech on the off chance that we’d win. Because how often do you have a chance to write an Oscar speech in your life? Emily Care Boss held the speech as she accepted the award on our behalf. Thank you for this awesome recognition. It is particularly heartwarming, because people outside the Nordic scene — people like you — are the audience we were thinking of when we created the book. It is humbling to be recognized in this community, because our hobby grew from the seeds planted by the American tabletop role-playing industry, and we feel honored to have been able to bring something back to the table. Even though there are only two names on the cover of Nordic Larp, this book has been a group effort. Over 50 people contributed to the book in one way or another. But even more importantly, it was a community effort. The vibrant Nordic larp scene not only supported us through the process, but it of course created all the awesome games we had the privilege to work on. The book was very much created by the whole scene, and thus we see this award as a recognition for the whole the scene. Finally, we see this award as a vindication of taking role-playing seriously. Role-playing is not only a fun pastime, but also a sophisticated form of expression, fully worthy of study and critique. As participatory art is difficult to grasp with the vocabulary of traditional media, it falls unto us, the scene, to explain our passion to each other, and to the outside world — if we ever expect it to be understood. You can now order the book online from the webshop Fëa. It offers worldwide delivery from Sweden, so the price of postage and packaging varies based on how far from Jönköping you live. In the future Fëa will also stock other Nordic books and magazines on role-playing games and larp. The proud parents. 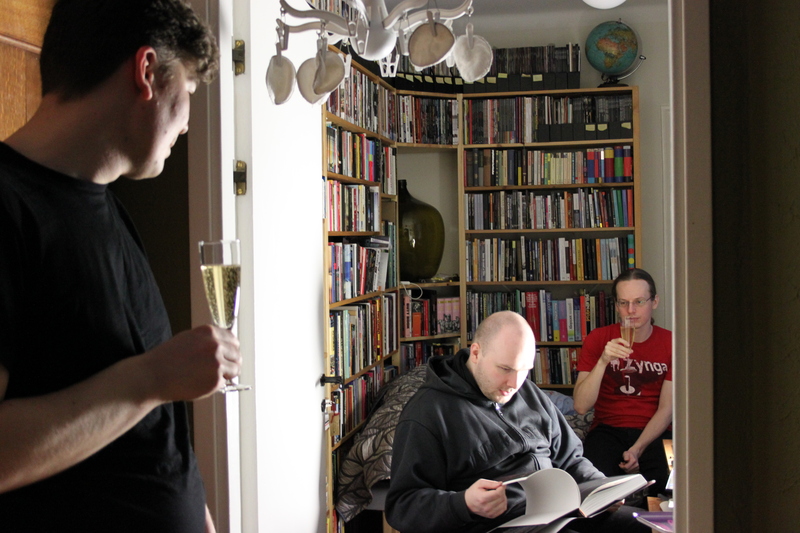 Based on Jaakko's grin he is planning on taking over the world with the book. The book arrived from the printing press today! It was printed in Estonia and reached Finland today. It should be in Stockholm tomorrow and in Copenhagen and Oslo latest on Wednesday just before the release party. Strategic measurements are as follows: weight 1,9 kg, height 28 cm, width 24,6 cm and thickness 3,5 cm. Yes, we did open a bottle of champagne. Don’t forget to come to the release party on Wednesday at 19:00 is Helsinki, Stockholm, Oslo and Copenhagen! Juhana Pettersson, one of the authors, just happened to stop by. He surveys the book here as the editors look on. Nordic Larp hit the printers a few weeks ago. The book will be released on the 22nd of December in four simultaneous parties in Helsinki, Stockholm, Oslo and Copenhagen. The parties kick off at 19:00 local time. The Stockholm part fill be held in Betahaus (Skeppsholmen 30), and in Helsinki the location is Dubrovnik Lounge (Eerikinkatu 11). Locations in Oslo and Copenhagen are not yet decided, though. These parties are probably the only chance to get the book before Christmas. The book costs 30 Euros. Later on the book will be availble through a webshop and the better role-play/larp shops across the Nordics. You are hereby invited to join the parties. Feel free to bring a friend. After more than a year of work, we feel proud, happy and relieved to publish the first preview drafts of the Nordic Larp layout. These are not final, but this is generally how the final book will be like. So here you go, with The White Road, Luminescence, Dragonbane and System Danmarc. Trust me, the early stuff on The Executive Game and PehmoYdin looks equally brilliant. 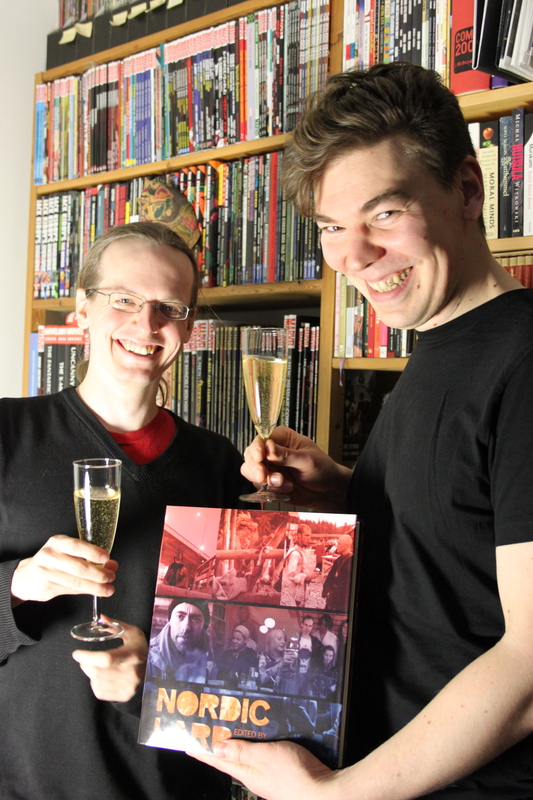 For the stunning visuals of the book, we are grateful to our endlessly patient layout artist and photo editor Tommi, to our photography experts Katri and Suvi, and obviously to all our first-class photographers. If you want to comment the drafts, please email your comments to nordic.larp at gmail. We’ll also close down the crowd financing soon, so sign up for it now or never. Remember, for the supporter price of €50 you’ll get your name on the list of supporters, and a copy of the book at the first opportunity. We might also hug you in Knudepunkt. While our finances are well in order for printing, hard covers and luxurious paper, trickles like these can make or break the deal when it comes to things like dust jackets, final print run and some details of distribution. The marathon of making this happen is turning into the final sprint. Happily, there seems to be light in the end of the tunnel. PARTIAL DRAFT, click below fro the whole shebang. One of the things we try to do with Nordic Larp is to paint a big picture of the Nordic larp scene. One of the nice things in editing the 29 different stories about larps is seeing their commonalities and differences. A nice palette of tools, an interesting repertoire of genres and so forth: Looking at the manuscript and the photos made me realize only now that indeed, System Danmarc belongs to the old tradition of village larps, making it as much a follower of Trenne byar in that sense as Dragonbane is. One exercise in this is that we think about putting a table of This Stuff to the intro of the book, painting broad lines and generic thematical similarities between our material. 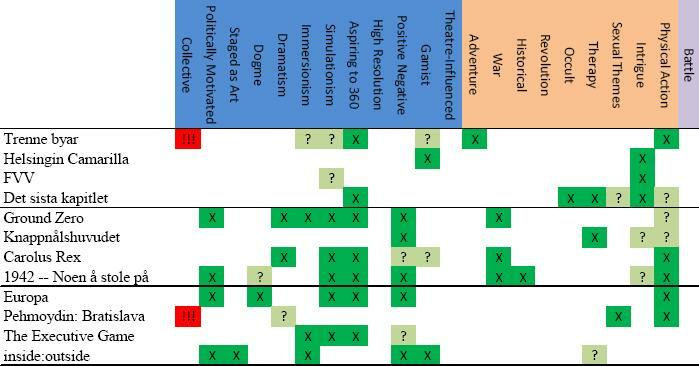 We have made work version of the table, and would invite you to comment below if you can add to our knowledge, or disagree with our draft. Some of the categories are flimsier than others, and feel free to point out our errors in that sense as well: Physical Action and Therapy especially turned out to be a bit weird. The final version will probably be a bit cut down version of this anyway, so take this as a brainstorm draft. X is intended to signify a strong relevance of a theme, ? indicates weak, accidental or partially failed relevance, and !!! means that we really need your opinion.